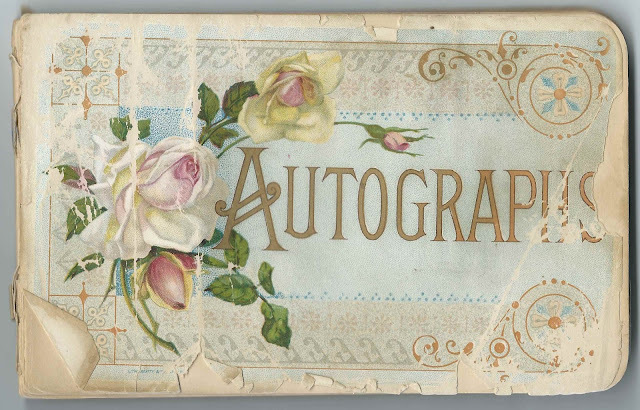 1890s autograph album of Emma Tucker of Bentley, Illinois, which many inscribers spelled as Bently. The inscriptions range from Illinois to Indiana, Kansas, Missouri. To have acquired inscriptions from such a wide area, Emma might have participated in religious retreats. The album, which measures about 7-3/4" by 4-3/4", is in rough shape and may be missing covers, if it ever had them. 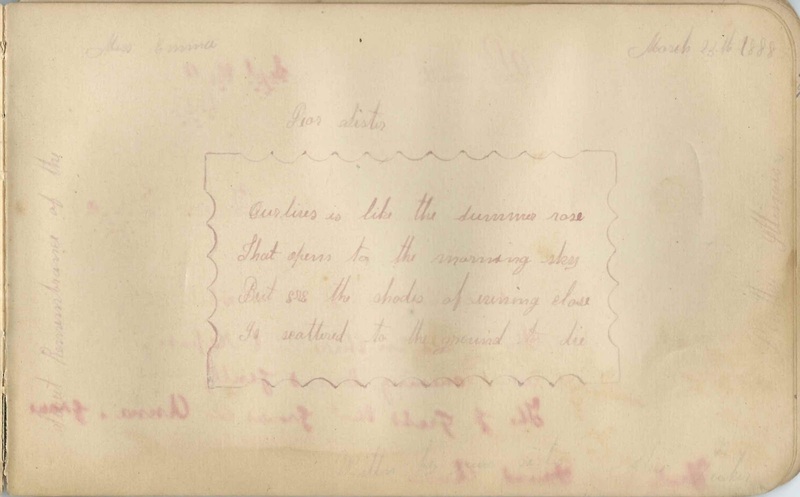 Many pages are disbound, and there might be missing pages, including a page where Emma might have inscribed her name. several people directed their inscriptions to "Emma Tucker"
several of Emma's sisters inscribed pages - though I suspect that some of the inscribers who called Emma sister were in-laws or religious acquaintances. Ausmus ? Hatton Ronken or Rankin ? Bishop J Jenkins Starkey ? Emma Frances Tucker was born in 1872 in Ohio, the daughter of Benjamin Franklin Tucker and Martha Eve (Preston) Tucker. Sisters who inscribed pages in the album and whose names I could discern were Cora Belle Tucker, Tamer Tucker and Martha H. Tucker. Another name was difficult to interpret. Ernest Hopkins, inscribed at Middle Creek, on August 22, 1887. Emma's cousin. Ernest E. Hopkins. The Addie who inscribed the right facing page may have been Ernest's wife Minerva Adeline (Kimbrough) Hopkins. On January 4, 1893 in Hancock County, Illinois, Emma Frances Tucker married Wilborn Owen Mecum. Wilborn was born in Illinois in 1865, son of James Madison Mecum and Verlinna (Dorsett) Mecum. Emma and Wilburn farmed in Illinois and had, I think, four children. Wilborn died in 1929 and Emma in 1953; they're buried with relatives in the Harmony Cemetery at Bentley, Illinois. Belle B? ; inscribed at Colchester, Illinois. Surname possible Barber or Bamber or ? H. E. ?, possibly H. E. Quint or Owens or ? 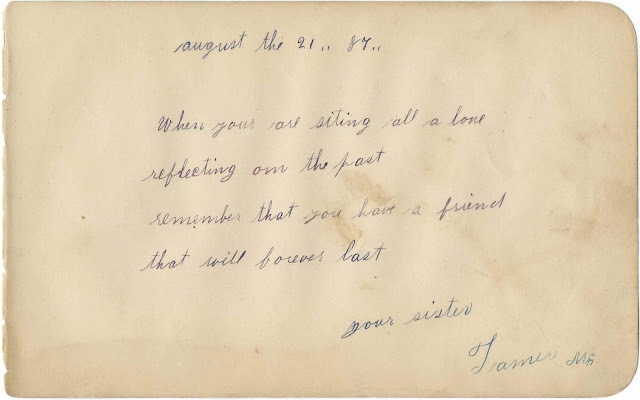 Unsigned; "guess if you can"
David Bartley; inscribed at New Castle, Indiana, on November 5, 1889. 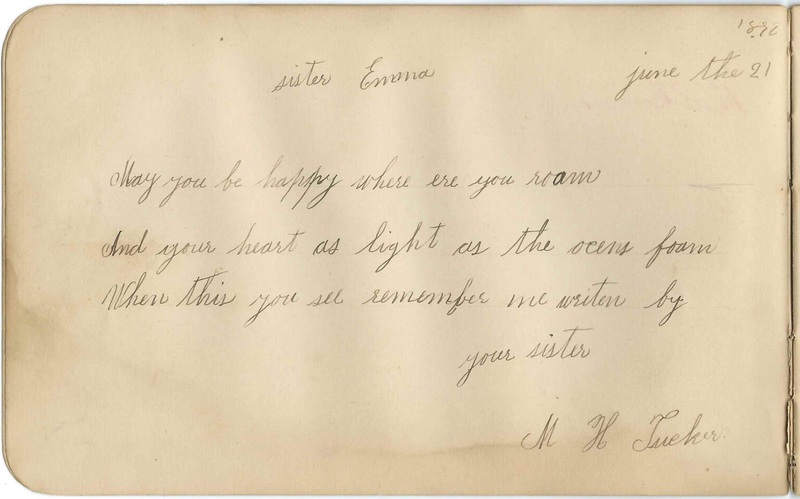 Inscribed to "Sister Emma"
M. E. Boston; inscribed on August 10, 1888. Written on the page upside down. M. C. Busk, or M. C. Bush; not sure of surname] of Steffenville, Missouri in Lewis County. Walter Dunsworth; inscribed at Bently, Illinois, on February 19, 1888. The abbrev. "Hon" appears before Walter, but may have been added at a later time. Mattie Hatton; inscribed at Ursa, Illinois, on September 16, 1888. Mentions "Middle Creek Association"
Addie; inscribed at Bently, Illinois, on August 22, 1887. Emma's cousin. 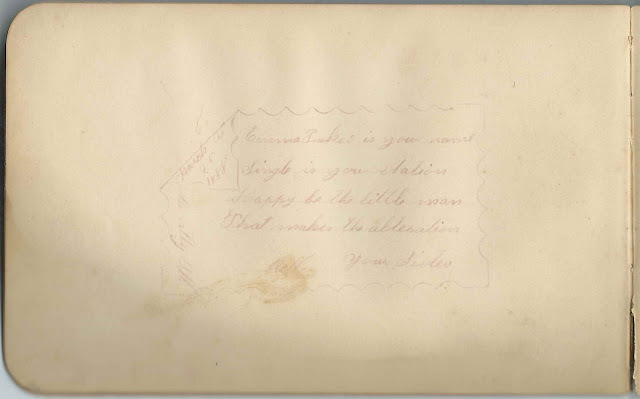 She was possibly Minerva Adeline (Kimbrough) Hopkins, whose husband Ernest Hopkins inscribed the left facing page. O. C. Kirkpatrick; inscribed on October 1, 1888. Emma's teacher. Orville C. Kirkpatrick, who later became an attorney. Adelia; inscribed on May 10, 1889. Possibly Adelia Langford, as the facing page was inscribed by Amanda L., who may have been Amanda Langford, younger sister of Adelia Langford. Amanda L.; inscribed at Bently, Illinois, on May 10, 1889. 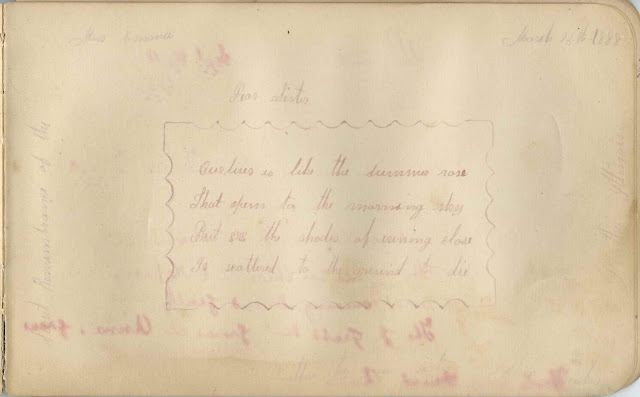 Possibly Amanda Langford, as the facing page is inscribed by an Amelia, and Amanda Langford had a sister Amelia. Lemuel Potter; inscribed at Fort Branch, Indiana, on July 23, 1891. Signed "Your Brother"